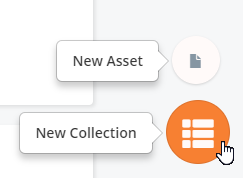 Create collections to organize assets you’ve uploaded to Chipmunk. After filling in the requested information and clicking “Create” you’ll be sent into the collection. From here, hover over the button to add new or existing assets to your new collection.